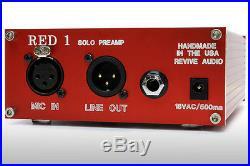 Vintage Audio Red Solo Preamp. The Red Solo Preamp is a Home Brew from, Jason lambson, the engineer behind Vintage Audio and is an all new Design that is unique in architecture, with Solo artists needs in mind. We have received a lot of emails over the years asking us to design a single channel preamp with all of the sonic quality youve come to expect from Vintage Audios designs and now at long last it has arrived! 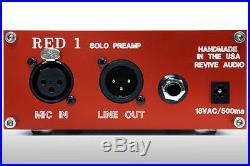 The Red Solo Pre is a perfect partner for solists who just need one excellent preamp to do it all. Due to its compact size, high headroom and bandwidth, not to mention sleek look, it meets all of these needs handily at a price that is affordable and is built in the USA with the quality you expect from Vintage Audio Designs. The design Features 60Db worth of gain, an ultra low noise floor, Excellent Bandwidth and headroom, Fet DI input and a transformer output switching option to sit any source perfectly in the mix. The Red Solo is unlike any design you have heard and is a boutique preamp that is perfect for vocals and guitar recordings all with the ease of one dial. Get a pair and throw them on overheads and they will astonish you! The Red Solo Pre, like all Vintage Audio units, utilizes Mil Spec components and the finest parts throughout, for the utmost clarity and lowest possible noise. We have taken all of our years of experience Modifying equipment and tailoring sound to squeeze excellence into a desktop box worthy of any application but with Solists specifically in mind. Its ultralow noise floor and sonic character was designed to sit vocals perfectly into any mix. Put it on Guitar, drums and more and let the preamp do the work! By switching between Transformer and Active output stages you can sonically shift the Harmonic content in a way that fits your needs and is one of our favorite features. The DI on these is a no compromise J-fet design with loads of headroom and dynamic range that is one of the finest DIs on the market. These beautiful preamps are handmade here in our shop in the USA and are completely hand wired like all of our models. 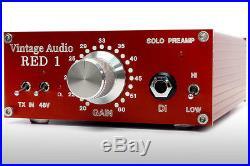 Simplicity and Beauty is the Mantra of Vintage Audio and the Red Solo is not exception Features. Remote Relay switched: Transformer output/Active output option. 48Volt phantom is on board for condensers and other studio microphones. Vintage DBX 130020 output transformer. High Performance Burr Brown amps. Noise floor: 150 Ohm source: <-128dB. 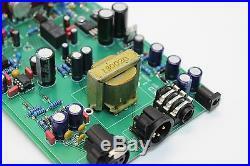 High quality Panasonic, Vishay and Wima parts for all PCB mounted components. We understand that Audio is your business and is an investment. I have designed all of our preamps and compressors not only to sound second to none but to last for years and years to come. Please be aware that by purchasing this unit you are agreeing to these terms. 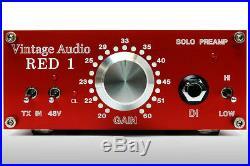 The item "VINTAGE AUDIO RED SOLO PREAMP, DESKTOP BOUTIQUE MIC PREAMP AND DI" is in sale since Saturday, March 25, 2017. This item is in the category "Musical Instruments & Gear\Pro Audio Equipment\Preamps & Channel Strips". The seller is "reviveaudio" and is located in Boise, Idaho. This item can be shipped to United States.